Rochester, New York's Empire Masonry Heaters could, however. They helped the architects enliven the flue chamber, covering the refractory cement with patterned tiles reminiscent of an intricate mosaic. Their ornamental chamber doubles as a café bench. The kachelofen is known in North America simply as a masonry heater. While its winter-busting abilities are new to Buffalo, it is a centuries-old form of heating in Northern Europe. North America is “a fertile ground for new developments on masonry heater construction,” said the architects of the cheekily-dubbed Cafe Fargo. “It seems also with a widening consciousness about 'green' forms of heating, and rising heating costs, the good old masonry heater is grabbing peoples' interest,” they told AN. 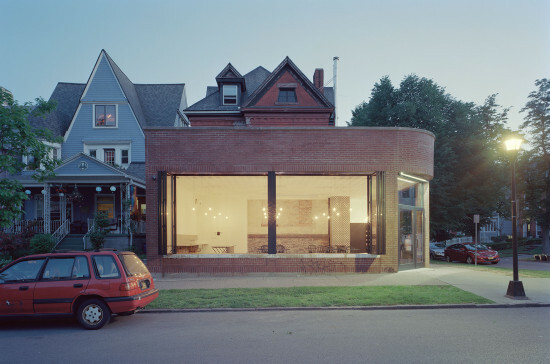 At only 880 square feet, their cafe is well-suited to the system. But Davidson and Rafailidis said masonry heating could work in larger spaces, too, but it might require several heaters to evenly heat multiple rooms. Wood-fired systems also need to be constantly monitored. Buffalo takes a degree of pride in its cold and snowy conditions, but if you've warmed up to the radiant heat of Cafe Fargo you may want to drop by—it's still looking for a tenant. Boston Valley Terra Cotta restored the Alberta Legislature Building's century-old dome using a combination of digital and traditional techniques. Restoring a century-old terra cotta dome without blueprints would be a painstaking process in any conditions. Add long snowy winters and an aggressive freeze/thaw cycle, and things start to get really interesting. For their reconstruction of the Alberta Legislature Building dome, the craftsmen at Boston Valley Terra Cotta had a lot to think about, from developing a formula for a clay that would stand up to Edmonton’s swings in temperatures, to organizing just-in-time delivery of 18,841 components. Their answer? Technology. Thanks to an ongoing partnership with Omar Khan at the University at Buffalo’s School of Architecture and Planning, the Orchard Park, New York, firm’s employees are as comfortable with computers as they are with hand tools. On site in Edmonton, technicians took a 3D laser scan of the dome prior to disassembly. They also tagged specific terra cotta pieces to send to New York as samples. These pieces, which ranged from simple blocks to gargoyles and capitals, went straight to the in-house lab for scanning into Rhino. The drafting department combined the overall scan with the individual scans to create a total picture of the dome’s surface geometry and depth. The individual scans, in addition, were critical to making the approximately 508 unique molds employed on the project. To compensate for the eight percent shrinkage clay goes through during drying and firing, the craftsmen at Boston Valley used to have to perform a series of calculations before building a mold. “[Now we] take the scan data and increase by eight percent by simply doing a mouse click,” said Boston Valley national sales manager Bill Pottle. In some cases, the craftsmen converted the scan data into a tool path for the five-axis CNC machine used to make the molds. “We’re doing that more and more in some of our mold making. It also allows us to ensure that we’re recreating them to the most exacting tolerance and dimensions that we can,” said Pottle. 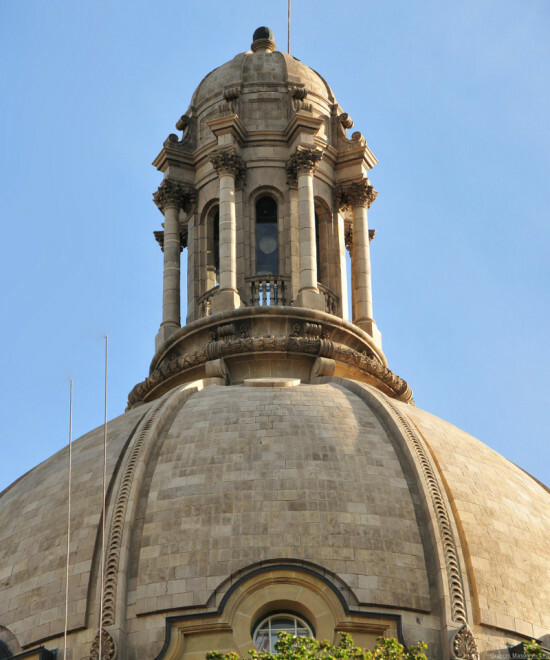 The data from the 3D scans also helped the craftsmen replicate the dome’s complicated curvature. “Between the scanned pieces and the scan of the dome itself, we were able to figure out some very complex geometry where each of these individual pieces had the correct shape to them,” said Pottle. In Griffis Sculpture Park near Buffalo, New York, a twisting triangular tower serves more than a purely aesthetic purpose. 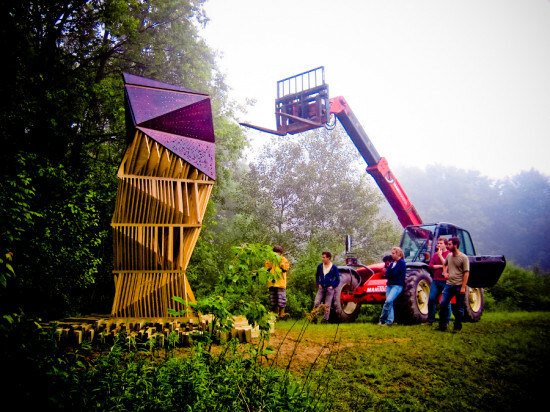 Designed by architect and assistant professor at the University of Buffalo, Joyce Hwang, the 12-foot-tall sculpture of stained plywood panels is conceptualized as a protective home for bats. Constructed conspicuously but practically, the University reports that Hwang’s Bat Tower is an effort to raise awareness for the recent disease-caused decline of these flying mammals, usually considered pests. Hwang, who teaches architecture and also directs her own firm, Ants of the Prairie, is committed to use of the built environment for the benefit of the natural environment. For Bat Tower, the construction is animal-friendly; five segments of wood panels create a stack of irregular triangular prisms and their vertically slatted widths (also triangle-shaped) have enough space between each panel for the bats to enter. Inside, the tower mimics a cave-like habitat and a series of screws and steel cables serve dual purpose to stabilize the tower and allow animal perches for hibernation. According to the University of Buffalo, while the bats are in this seasonal sleep, they can become susceptible to white-nose syndrome. Although little is know about the disease, it has already killed over one million of the Northeast's bat population. Hwang’s built habitat mimics the environment of a natural cave, giving bats a safe, familiar home. She also hopes that the bold design of her tower will encourage education about their recent devastation. As an architect, Hwang continuously explores the use of architecture for ecological benefit. “Since I was a graduate student, I have taken an interest in the constructive relationships between humans and animals, and how we can shape our environment in a beneficial way," she said. "Bat Tower draws attention to bats by challenging the notion of a bat house being something nondescript that fades into the background." A structural, textured metal system wins first place in a competition and the chance to develop a façade with Zahner. Bruscia said the computational models were heavily informed by material parameters. Working with various patterns in RM’s product library, the team started to see various textures performing differently in structural applications, though the company’s metals are typically used in cladding or decorative applications. “Rigidized Metals’ patterns are stronger than flat metals,” Romano said. “That informed how we selected textures and which became a part of the computational conversation.” Drawn to the geometry of the embossed 4LB sheet, they found the low relief pattern to perform comparably to a deeply stamped-style, and that it complemented other chosen patterns nicely. Structural loading was tested in Karamba, an architect-friendly finite element method analysis plugin for Rhino that was developed recently in Austria. Designed primarily in Rhino 5 and Grasshopper, the team also wrote many of their own scripts. For the SKIN competition, the team adjusted porosity of the screen to increase transparency for façade applications. The screen’s pattern is articulated from all perspectives, creating a dynamic quality that is achieved by a slight twist through the entire structure. “The twist in the system is a result of us getting the geometry on the screen for the system to perform structurally, and to make it possible to fabricate,” Romano said. “Some geometric moves on the screen can be difficult to fabricate, so to remove those you get subtle twisting in the elevation.” At RM’s Buffalo facility, profiles of the system’s components were turret-punched on a CNC, and folded on a press break to achieve a diamond shape. A tabbing system was also milled so the shapes could be fastened with stainless bolts to form a seamless, continuous cell structure. As part of the SKIN competition, Bruscia and Romano will continue working with RM, as well as A. Zahner Company, to fabricate a façade system with a glazing component. The 3xLP team will exhibit their results at the Tex-Fab 5 event in Austin, Texas on February 19. The 22-foot Elevator B honeybee habitat was the winning proposal in a design competition sponsored by Rigidized Metals and the University at Buffalo. The disquieting phenomenon of colony collapse disorder is seeing global bee populations vanish before our eyes, threatening the pollination of much of the world’s food crops. So when Buffalo, New York, metal fabricator Rigidized Metals discovered a colony of bees in an abandoned grain silo that its owner purchased, the company sponsored the Hive City competition. Students at the University at Buffalo (UB) were invited to design a viable bee habitat that would spark interest in the Silo City area and demonstrate the strengths of various building materials suppliers in Buffalo’s First Ward. As the first, permanent new construction on the Silo City site, Rigidized Metals wanted something that would be visible from nearby Ohio Street, stand out in the industrial landscape, and be reverent to neighboring silos. The winning design, known as Elevator B, is a 22-foot tower of 18-gauge sheet metal panels, with strategic perforations for natural ventilation, light, and heat management. An operable bee "cab" in the interior supports the actual hive on a pulley system, allowing beekeepers to access the colony and return it to a level that keeps the population safe from predators. "We did lots of research on how bees build hives and colonies," said Courtney Creenan, a student at UB's School of Architecture and Planning, and one of the designers of Elevator B. "The structure also induces the motion of standing inside of and looking up through a grain silo, where you have no where to look but up." However, instead of a perfectly rounded oculus at the tower’s summit, Elevator B viewers see the outline of a honeycomb. The student design team mocked up the tower with plywood cutouts in UB's School of Architecture workshops and Rigidized Metals fabricated the panels, but the design was completed in Grasshopper. The software helped determine a workable pattern of perforations, particularly along the top of the elevator where winds could compromise stability. 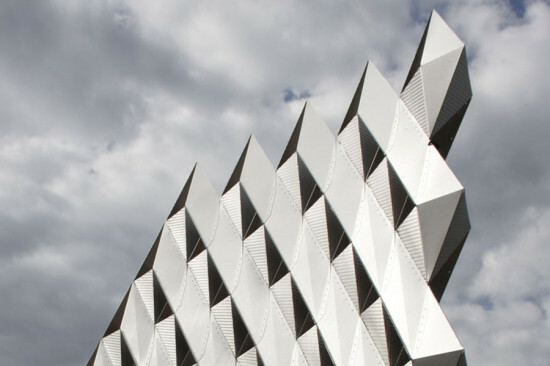 In the team’s initial design, all of the 70 metal panels received an 80 percent perforation, though each had a unique number of cuts in a unique array. 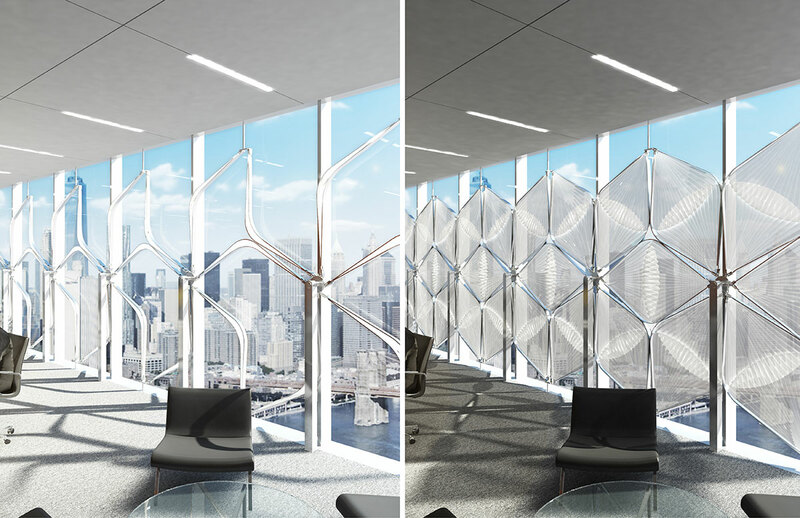 Grasshopper brought out the commonalities from these disparate patterns, and allowed the team to scale back to six types of panels with maximum perforations of 60 percent. "You can barely see a difference," Creenan commented. Once the design was simplified in Grasshopper, the Elevator B team devised a matrix to deliver to Rigidized Metals that indicated the number of panels to be fabricated and which had to be folded around the corners of the tower's steel frame. To ensure accurate installation on-site, each panel was numbered. Since the grain silos are unoccupied most of the time, with the exception of special events and tours, the tower had to be vandal resistant. The students fastened the panels to the frame with self-tapping screws, which required no predrilling. The steel frame was hand-made and the panels were machine-formed, but Creenan said there was little error and the pieces came together easily onsite. Beekeeper Phillip Barr successfully relocated the bee colony in the spring of 2012 and it has survived its first Buffalo winter. With the warmer weather, the colony's member numbers are on the rise. And though Elevator B was designed specifically for bees, Creenan said that other animals have taken a shine to the tower. “Before [the bees] moved in we noticed robins had nested there," she said. Though the design team hasn't been approached about adapting its design for other animals throughout Buffalo's Olmsted-designed park system, Creenan likes the idea. "It'd be interesting to test this somewhere else in the city," she said.